Anthony was really stoked on Friday afternoon when we all went shopping, and he ended up with new shoes. 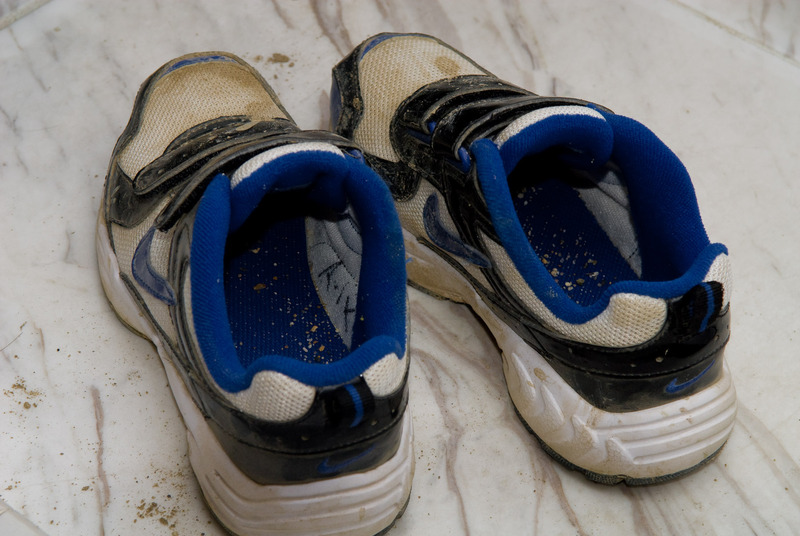 These had shiny leather... gleaming whites... cool blue... that all added up to shoes that he felt made him run faster. He was tickled pink. He was excited to show them to Gen when we went to his place on Saturday, and to show them to Fumie's mom on Sunday, and, well, to anyone and everyone we met. You couldn't help but laugh (unless you cried, which was a distinct option), so I had to take a picture. The lighting in our entry way is pretty bad, photographically speaking (it's mixed incandescent and fluorescent), so I decided to give flash a try. The result was very soft, natural, “unnoticed” lighting, which is what I wanted. 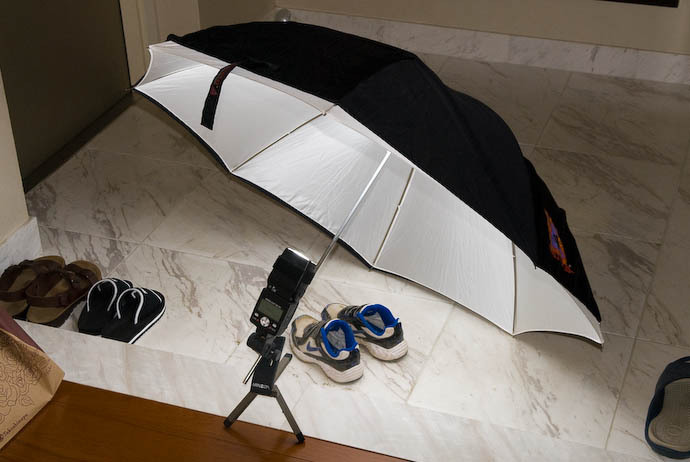 Lighting setups don't come much easier than this, but with my lack of flash experience, any success is noteworthy. 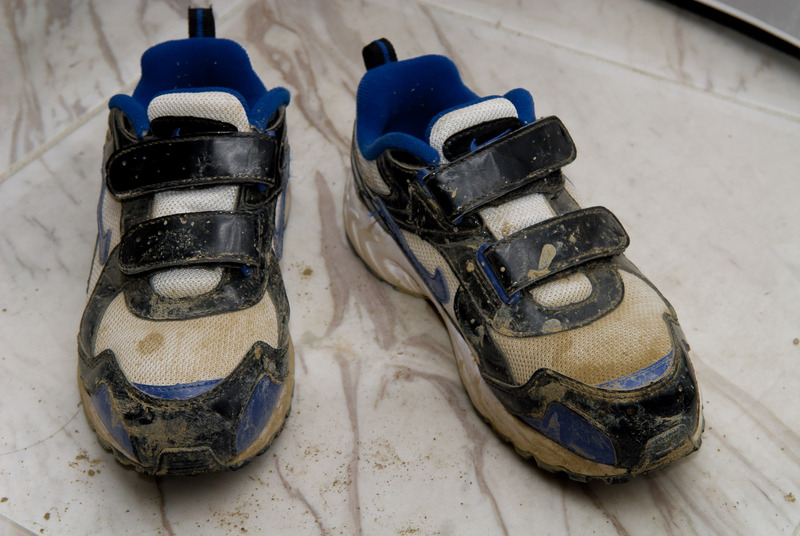 a) Your little boy had new shoes on Friday, and on Monday, they WERE STILL CLEAN. Three days without one mud puddle – you ought to call Guinness book. It doesn’t matter if he was inside the whole time, or there has been no rain in the last month, or you were in sub-Saharan Africa. They can usually find a puddle, no problem. Three minutes is more like it. b) You can still discern colors easily on the shoes. That shows great restraint on Anthony’s part. c) You can still discern that they are SHOES. I’m sure you must remember some of the shapeless globs of mud with laces you left beside the back door growing up! Oh, and good job with the lighting –no shadows at all! I’m still working on that. I can see that putting the umbrella as close as possible eliminated the shadows. What is the brand/name of that little handy stand for the flash? I use a big light stand and it works great but sometimes it would be good to just have little “feet” like that. BTW, leave it to Jeffrey to light dirty shoes strobist style.